Town Hall | Our Homes Can’t Wait! 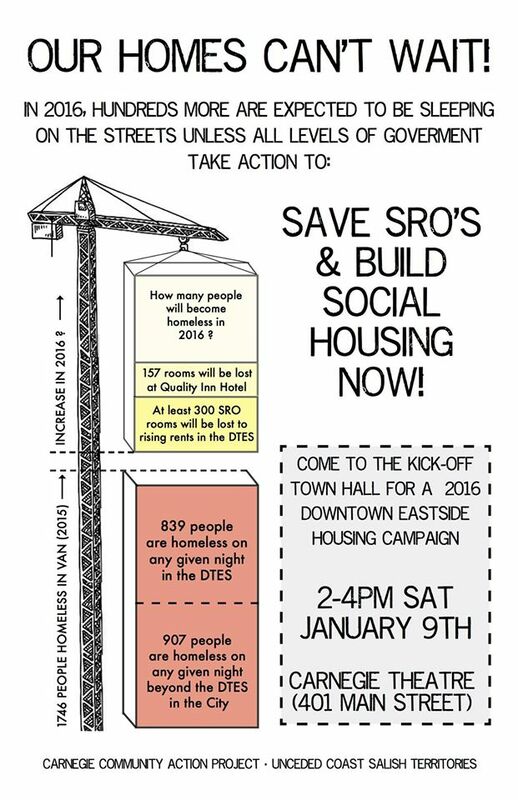 Save SRO’s and Build Social Housing Now! In 2016 we need to step up the housing struggle. On January 9th, the Carnegie Community Action Project (CCAP) is hosting a Town Hall meeting to kick off a 2016 Downtown Eastside housing campaign. We need all levels of government to take immediate actions to stop the loss of SRO hotels and build social housing at welfare rates. Our homes can’t wait! Join us for a public forum and discussion about what needs to be done to address the housing crisis in the Downtown Eastside in 2016 and onwards. Come hear from Downtown Eastside community groups and speakers. Snacks and coffee will be provided. The town hall will be taking place on the unceded coast salish territories of the Musqueam (xʷməθkʷəy̓əm), Tsleil-Wauthuth (Səl̓ílwətaʔ/Selilwitulh) and Squamish (Skwxwú7mesh Úxwumixw) peoples. This year saw record high homelessness in the Downtown Eastside, with 836 people living on the streets and in shelters. Sequel 138 is opening its doors in January, “Woodwards East” is under construction (955 E Hastings), new condo developments are underway in Chinatown, a “tech hub” will be opening at the old cop shop in 2016, and a renewed street sweep has pushed homeless people and survival street vendors off East Hastings. Despite this worsening housing crisis, only a handful of new welfare rate units will open in 2016. The city’s lease on the Quality Inn will also expire, effectively removing 157 rooms from the affordable housing list. To make matters worse, we are rapidly losing affordable SRO units – the last stop before homelessness – as gentrification continues to push up rents. In the Downtown Eastside alone, over 300 affordable SRO rooms were lost in 2014. With new condos opening up across the Downtown Eastside we expect to lose hundreds more SRO units in the coming years. We need to urgently develop a strategic campaign that will force all levels of government to address this impending and ongoing crisis, stop the hotel losses, and provide affordable housing for low-income people. More than ever we need to work together to support each other, coordinate our actions, and create a united front against displacement and for social housing. United we are stronger! « City’s proposed tenant protection reforms will not change the status quo	» Response to Pete McMartin’s article “The high cost of misery in Vancouver’s Downtown Eastside.